OK, right now I'm just a little bit too pleased with myself. 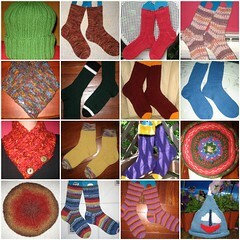 First of all, I created this collage/mosaic of the knitting I completed during 2008. Then, I figured out how to get it to load directly from Flickr. Am I a techno-wonder or what??? Seriously, though, I am surprised at myself for having completed sixteen projects during the past year! I'm pretty sure that I haven't even come close to half that number before. Granted, ten of the projects were my Christmas gift socks, but still ... I'm happy that I did it. And, given that these kind of things please me inordinately, how cool is it that it turns out into a nice even amount for the grid of photos?? I have been busy thinking about what I want to do next, how to rearrange things here in the craft room/office (more on that later). I do think that there are a few UFOs (for the non-knitters, UFO = UnFinished Object) that will be frogged (again, frogged equals taken off the needles and rolled back into a ball of yarn - as in, "rip it, rip it" - hey I don't make these things up). I can think of two right off the bat that just need a new life and identity. I have to say that for the most part, 2008 was a good year for me. Sure, there were some things I would have skipped, given the choice, but overall, things went well, and I feel like next year can only be better. Regardless of how I feel, I'm always a little sad to see the year end - I guess it's the "official" passage of time that gets to me. But doesn't everyone always want the next year to be better? The Tim and I will be celebrating as usual, going out to a Thai place for dinner (relatively early, since we aren't into being around drunken crowds of strangers), then some champagne, shrimp, and Holiday Cheeseball around midnight, while we watch the ball drop. 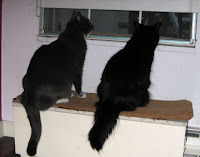 It's just us and the kitties, and I think it's a fine way to end one year and begin another. On that note, I will sign off for 2008. Thanks to all of my blogging friends, you have definitely been one of the best things about the year! Here's hoping that 2009 will be good to all of us, and that we'll continue our friendships. Be well, and happy knitting! I took some pictures of a few gifts I received that I want to post, but haven't gotten them into the computer yet, so today I'm doing a little bit of housekeeping. Even before I learned how to knit, yarn fascinated me. It all felt different, and there were so many colors! Take into consideration that this was long before it even occurred to me that there were actually places called Yarn Shops (! ), and so most of what I was exposed to was yarn sold at places like K Mart, or Lee Wards (remember that? There was one in one of the next suburbs over from our apartment when we lived in Chicago). Little did I know that there was a whole other world o' yarn out there! You want to know another great thing about Zach? 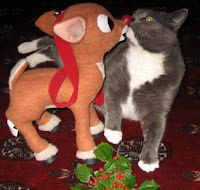 He is a true devotee and lover of all things Rudolph! Need I say more about him being a great kid?? I've enjoyed the ABC-Along, even though I was behind on occasion. But it was fun to think of what image to use for what letter, and though I'm sure I could have been more creative, I signed up mainly to see if I would stick with it, and I did. Therefore, I think it only appropriate that I celebrate with a glass of wine! I know that once you had the chance to open your Christmas/Hanukkah/Festivus gifts, your very next thought was, "When will Bridget post pictures of the gifts she knit for Christmas, like she has been promising?" Clockwise from the top: Crazy Cable Cuff Socks, Blueberry Waffle Socks, Go Redskins! Socks, Calico Confetti Socks, Bon-Bon Socklettes, Go Ravens! 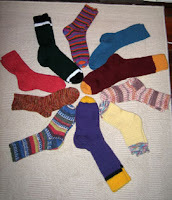 Socks, Amanda's Alpine Socks, Southwest Socks, Hedgerow Socks, and Fly Eagles Fly! Socks. Yep, those are the socks I knit over the past year for my nieces and nephews and their respective partners, ten pairs in all! (Yes, I know the year has 12 months. Now go away if you were going to point that out.) And, I had all of the yarn in my stash, so I could just "shop" for yarn here at home ... I am really pleased with how they turned out, and that I actually managed to knit them all with plenty of time to send them to their respective recipients. A couple of weekends ago, when my nieces and their families came up and we headed to Karen and Seb's to help decorate their tree, I was able to gift four of the pairs and see the reactions for myself. They were great, everyone was either a) truly thrilled/touched, or b) incredibly convincing in their acting abilities. (Personally, I chose "a.") Amanda's husband Pat actually started to cry, saying that no one ever made him anything before, and he couldn't believe that I took the time to do so, and Liz's husband Greg said that not only was it nice that someone in the family paid attention to people's sports preferences, but then that they "stroked it," which I find highly amusing. If you would like details about any of them, and you are on Ravelry, you can look at my projects page. If you are not on Ravelry, and are dying to know, feel free to e-mail me (link on sidebar), and I'll tell you what you would like to know. If you want to see close-ups of the images, you can look at my Flickr set (my Flickr ID is thekittyknitter). At the point when I finished knitting the last pair of socks, I still wanted to make a neck warmer for Karen (see this post). 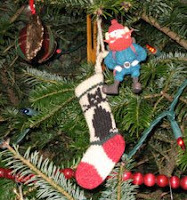 When I started that, The Tim said something to the effect that he thought it was great how much I'd accomplished this year, and the only disappointing thing he could think of, was that he was not likely to get anything knitted for Christmas. Ta-da! It's a hat that I managed to start on December 18, and I wove in the ends the morning of Christmas Eve. Considering the fact that there were about three days when I didn't even knit a row on it, I was really excited to get it finished in time to give him. 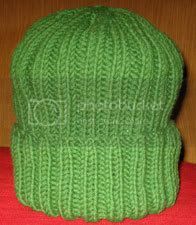 Pattern: I call this Tim's Yak Hat, but the official name of the pattern is Mr. Yak's Hat. Needles: US 8, 16-inch circular. Comments: A great pattern, and the cushiest, nicest yarn ever! It was very occasionally splitty in parts, but otherwise, it was really enjoyable to use. OK, I have lazed around long enough - time to get dressed and get the rest of the day underway! 3. Check your e-mail/read your blogs. 4. Don't wait until the last minute to be sure you are in good standing with Santa. 5. Take some time to enjoy your decorations. 8. Don't let anyone pick a fight with you. 9. Remember loved ones that are no longer here. 10. Check the sky conditions. 11. Get a good rest, and let Santa do his work! A townhouse, red brick, with decorations - not unlike our house! It's one of those ornaments with an opening in the back for a small light, and it looks very cozy on our tree. This Santa Lucia mouse is one of the cats' favorites. 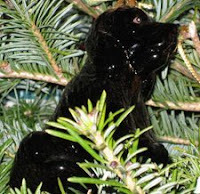 She often disappears from the tree, and is later found elsewhere in the house, fortunately never worse for the wear. A couple of years ago, I was walking home from work one evening, and someone had put a Christmas tree on the curb to be collected by the Sanitation Department. 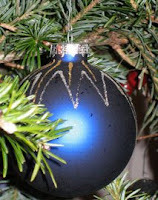 I noticed it still had this ornament on it, so I rescued it from a terrible demise! 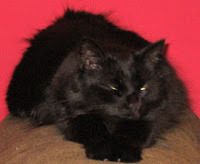 Here we have Yukon Cornelius, from"Rudolph the Red-Nosed Reindeer," and one of the black cat stocking ornaments (we've had two black cats, so there are two of these). Santa brought this ornament a couple of years ago, since it looked like Doughboy. And every year, my nephew's wife sends us some decoration or ornaments that are personalized by their four children. These are Santas, made from molds of their hands. I think they are pretty cute. 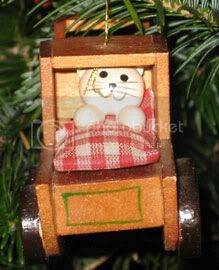 A lot of our ornaments and decorations are either personal (like these), from a vacation trip, or bought for special people, animals, or occasions. It makes it even more fun every year when we pull them out, to remember how/where we got them. 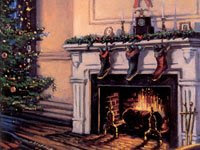 As much as I enjoy presents, as long as I have my Christmas decorations, Christmastime is here as far as I'm concerned! In the old days, it was not called the Holiday Season; the Christians called it "Christmas" and went to church; the Jews called it "Hanukkah" and went to synagogue; the atheists went to parties and drank. People passing each other on the street would say "Merry Christmas!" or "Happy Hanukkah!" or (to the atheists) "Look out for the wall!" 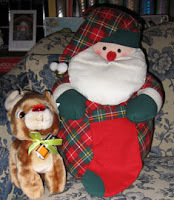 Here's Santa and Rudolph hanging out on our couch in the living room. 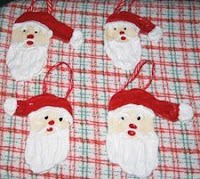 The Santa is one that I sewed myself about fifteen years ago, for our kitty Hannah. Her nickname was "Jinglepuss," and this Santa has jingle bells on the tip of his hat, along with the pompoms. The little stuffed Rudolph was something that I sent in a UPC code for Duracell batteries to get about twenty years ago. If you press his left ear, his nose lights up. We have never even tried to take out, or change the battery, and he still works every year! 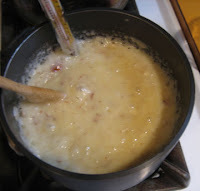 Using a heavy 3-quart saucepan, blend butter, sugar, and cream of tartar over medium high to high heat. 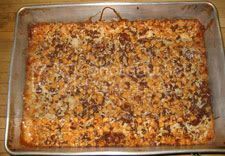 Add 1 ½ cups sliced natural almonds, and continue stirring until mixture has carmelized, or turned the color of peanut butter. While still hot, sprinkle with chocolate chips. When melted, use a knife to spread chocolate over toffee mixture like frosting. Sprinkle lightly with remaining almonds and let cool completely. 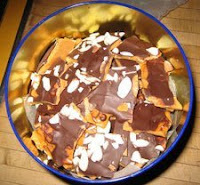 Set cookie sheets in a cool, dry place overnight, for toffee and chocolate to set. Hit candy with the back of a butter knife to break into pieces, or break by hand. But it is yummy, so if you try it, I hope you'll enjoy it! *I have noticed on more than one occasion, that when I pour the mixture onto the cookie sheets, it forms a shape evocative of the map of Ireland. Hm. **If you want to print the recipe, without printing this whole post and the pictures, it can also be found here. Yep, in only seven days, it will be Christmas Day! I feel like I'm really, really close to being ready. In spite of the fact that there were times over the past year when I was working on Christmas knitting, and wondering if I'd ever be knitting something that wasn't a gift again, the fact that it was finished by the end of November really made a big difference. I've been later than I'd like sending packages (tomorrow the last ones will go out), but everything else is pretty much on track. 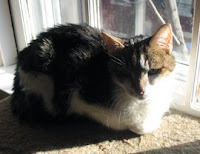 Today's decorations picture features Jetsam at one of the windows looking out to our garden. The windows have security bars on them, which serve that purpose but also provide a nice place for some of the smaller decorations. 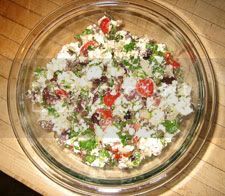 I thought that I would share one of my favorite recipes with you today. This is not only yummy, but it's a great thing to fix when you have invited guests for breakfast/brunch, and you don't want to have to be doing a lot right at the last minute - one option is to prepare it the night before, and then cover and refrigerate it until the next morning. I've never had this one go wrong. It's called Mainstay French Toast, and the recipe is from the Mainstay Inn, at Cape May, New Jersey. You can find the recipe here. Enjoy! (Notice the paw in the lower left corner ...) This is a project bag I bought around this time last year from Stuck in Illinois. She has so many great bags, but of course, since the Rankin-Bass "Rudolph the Red-Nosed Reindeer" is my most favorite Christmas show, I just had to have this one! It's really well-made, and her service was wonderful. I would say if you are looking for a little gift for a fellow knitter (or for yourself! ), you should take a look. 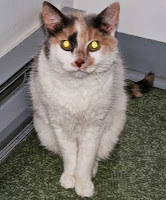 That's it for now - say goodnight, Gracie. 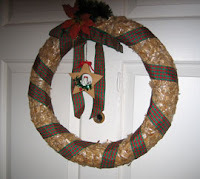 Today's Christmas decoration is the wreath that hangs on the inside of one of our front doors (we have two front doors, as our house was originally two houses on different blocks. It's a long story. I'll tell you some day). Anyway, this may not look all that amazing to you, but this was one of the first decorations from the first Christmas (lo those many years ago) that The Tim and I were married. We visited a local crafts store and bought the materials, and then created this masterpiece ourselves. It hung on the door of our apartment in married student housing at Notre Dame. Being that it was thirty years ago, and we likely spent about $5.99 for materials, not a bad investment, huh? Not only did I forget to thank her, I forgot to post about it! Apologies, Maureen, I didn't mean to seem like such an ingrate. Maureen and I "met" about two years ago, in a holiday swap, and have been friends ever since. She lives in Canadia, and you all know how I do love Canadia, so it seems like we would have to have gotten along, right? 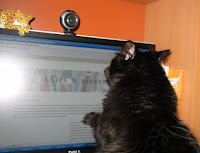 She has lots of blog friends, so I was especially touched that she included me on her list of blogs for this award. Thank you so much! At this point, so many others have posted about receiving this award, my brain is not currently in a state to ponder those who haven't. Forgive me for being too mush-brained at the moment to pass it along to anyone else. Earlier in the fall, I signed up for Back-Tack 4, a swap with a holiday theme. You may remember the neck warmer I made for Kaitlyn, my swap partner. She sent me a wonderful package, and I forgot to post about it until now. Beautiful, no? 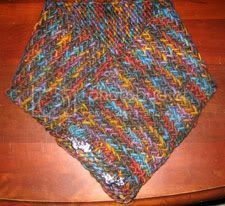 She knit me the most amazingly cushy, cheery scarf, and then a drawstring bag to go with it! (She's a relatively new knitter, too - amazing!) The three items in the small white tubes in the front are homemade lip balms - one peppermint and two honey vanilla. They are incredible, and just the right amount of scent/flavor. And did you notice the pretty and sparkly gold drawstring on the bag - how Christmas-y is that? Also received (but not in the picture, 'cause I just couldn't get it to photograph decently) was a small, aquamarine flip-flop charm for a necklace or bracelet! It's really cute, and quite sparkly. (And you know I love sparkly, right?) Turns out that Kaitlyn and I have the same birthday (though I am approximately 152 years older than she is), so when she saw the charm, she thought it would be just right to include in the swap package. Thanks, Kaitlyn - the fact that you not only knit things for me, but also made the lip balm makes the whole thing that much more special. Now that a few of my secret Christmas knitting projects have been gifted, I can actually show them to you, and you don't have to be on Ravelry to see them. I couldn't get a photo that showed the buttons well, but they are silver buttons in the shape of a vintage high heel - perfect for Karen! This was knit last week, when I decided that I could get it finished in time to give her this past Saturday, when we got together to decorate their tree. She seemed really thrilled with it, and wore it the entire time we were at their house. Now, back to being so busy. Friday, I decided that I was going to start some of my baking. I really love Seven Layer Cookies, and since I had the ingredients, I figured that was as good a place as any to begin. They turned out well, and were not even has hard to get out of the pan as they usually are. It really is yummy, as well as easy to make. I used grape tomatoes, instead of the sundried ones called for in the recipe, and also added rinsed capers. The next time I make it, I will also rinse the olives first, 'cause it was just slightly too salty for my preference. But I will definitely make it again! 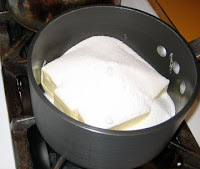 If you want to give it a try, the recipe is here. And that's it for now. 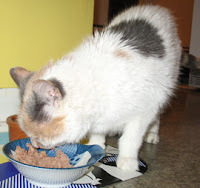 I have lots of other stuff - food, knitting, people, decorations - to share, but right now, it's off to feed the kitties as well as myself! It's me, Tess. You may remember me from various blog posts that my Ma has written, and/or from my letter to Santa last year. Well, if you have read this blog for even two days, you know that my Ma is a fanatic about holidays, and in particular, goes crazy over Christmas. As a matter of fact, the other day she said to me, "Tess, what is your favorite Christmas decoration?" Don't get me wrong, I think Christmas is a lot of fun. Ma and Da bring a TREE into the house, and put all kinds of decorations on it, some at the bottom, so that we can rearrange them as we see fit. (And trust me - they *need* to be rearranged - those two have a poor sense of composition!) 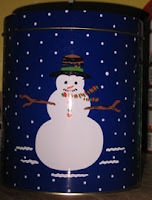 We get extra treats, the house usually is warm and smells good, and Santa brings us some surprises. Dressed up cats caroling??? Oh, I think not. This is clearly the creation of someone who either has never had a cat, or has only had cats like my lame-o brothers, who will do just about anything for people to think they are "cute," or "funny." No self-respecting cat would allow themselves to be caught in such a get-up for even a photograph, much less to model for a "sculpture." Now if these were dogs caroling, that would be different - dogs have no real self-respect, and will do just about anything when asked. Sure, some of them might be cute, or I guess there are even nice ones, but they are just so obvious in their intentions, don't you think? Now don't get me wrong, the decoration above is festive-looking, and it does tend to make people smile when they see it, which is what a Christmas decoration should do. Little children in particular seem to like it. But as we know, they have undeveloped brains and therefore, cannot grasp the ridiculousness of the whole scenario. And in our house, which is - shall we say - very decorated, this decoration is one of the few that is not in my way most of the time. Wait! What was I saying??? The Christmas Knitting, It Is Finished! The answer is yes and no. All of the gifts I decided I was going to knit last year, to give for Christmas this year, are finished. Like the Fly Eagles Fly! 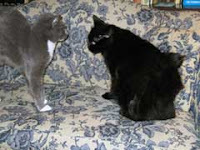 Socks, pictured here on the right. I finished them this past Sunday, meaning that I was even finished before December started! (Sadly, the Eagles aren't flying much this season. But like Christmas, football season comes around every year.) These are for my niece Julie's husband Keith (they are the ones who got married this summer in Puerto Rico), and I'm pleased with how well they turned out. The photo is kinda dark, but the main color is a forest green shade that in real life, pops out from the white stripe and black trim. Details are here on Ravelry, but basically I can tell you that it's my usual Yankee Knitter basic sock pattern, Encore yarn in forest green, white, and black, knit on #5 US needles. I figure they will be great socks to wear around their apartment without shoes, and since they are Encore, they are easily washed and thrown in the dryer. 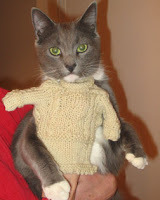 So in that sense, yes, the Christmas knitting is finished. But, now I'm thinking I have time to make a couple of more quick gifts. Like another Herringbone Neckwarmer for a friend, and something for The Tim. You may have been wondering where I have been, being that if you know me at all, you know I am very busy starting on December 1, counting down the days until Christmas. Well, never fear, I have been busy counting down until Christmas, and getting things organized, starting to decorate, etc. But I haven't posted, because for whatever reason, I just haven't had the energy so far this week. I think part of it is because of the Cough-That-Will-Not-Die-No-Matter-What-Medication-Is-Taken, which to be honest is wearing me out. However, I shall prevail because I refuse to allow it to become the Cough-That-Took-Over-Christmastime-and-Wouldn't-Let-Me-Enjoy-It. So there! Having said that, I feel it is my holiday duty to remind you that Christmas will in fact be here three weeks from today! I have put out some of our decorations, and this weekend, we are going to try and get our tree, so the holiday spirit is alive and well at Chez Ravell'd Sleave.